Dance Gear asked me to review this service, so this lovely leotard was kindly sent to me but all of the opinions in this post are my own! Read my full disclaimer here. Dance Gear's made to order service is the only one I have ever seen which caters to such a wide range of sizes, styles and fabric choice! I have been trying to find a leotard that I felt comfortable in for ages but everything was either very boring or obviously made for tiny people - in size and height. Upon inspection, the large and extra large sizes would often mean it might stretch to a 12-14 (I'm not exaggerating). 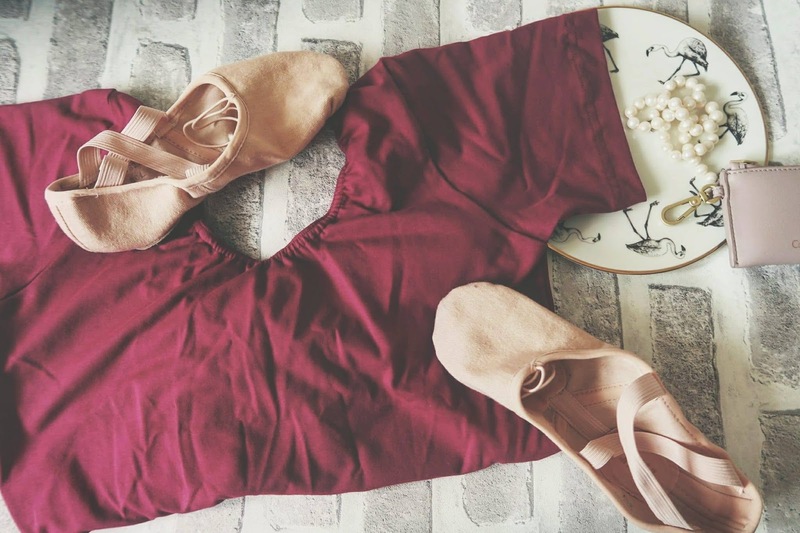 With adult and just for fun ballet classes booming, it's surprising more companies have not tapped into the potential profit of adults willing to spend money on their hobbies! But other companies' losses are Dance Gear's gains. The process itself was very quick and easy - you pick your style, your size, your material and your colour. Boom, done, all online and your item is made up and delivered super quickly - around a week for me but I can't be exact as I was away for work. Although it wasn't so easy to pick a style! It was so nice to not be limited to navy or black leotards - I know some schools have serious uniforms but I do ballet for fun and I would like a little pop of colour. I may have wanted something sensible - a leotard but there were loads to pick from. I went for the Tammy Leotard, which then meant I had the dilemma of what material to pick - I had almost picked purple velour before restraining myself and going for burgundy cotton lycra. I'm really pleased with my choice - it fits great and the material is comfortable and in a colour I love. One thing I was surprised about was how affordable this is - it really is on a par with your standard off the peg dance clothing (if not cheaper in some products), so I don't really see any negatives to the Dance Wear option as you get much more choice in style and fit for your money - particularly if you are on the curvy/baby elephant side of dance like me. Overall I would really recommend the Dance Gear made to order service, it was quick and easy with a great style and colour section at a great price for everyone but it particularly demands a mention for people who are outside the realms of traditionally ballet sizes and shapes and adult/just for fun dancers.